Miguel Muses | I'm onto something, I think. It’s been a week since our dearest Miles had passed on. Each day gets a little better. Or, perhaps more appropriately, each day of grieving feels a little less worse. The pain and the loss are never, not, felt. Only in doses a tad more tolerable. Grief feels like much like medicine – the kind you know you need but hate to ask for. That bitter taste that lingers long on your palate implores you to hope that, somehow, at the very least, it’s working. When my grandmother passed away several months ago, I had considered grief to be a gift. It felt, to me, the thing you choose for – that you’re willing to take on – when you lost something you loved. I loved my grandmother, in part, because the integrity of her character required only such a response. She didn’t “earn” my love, per se. But she elicited it from me, in the quietest possible way. I could not, not, love her. Her kindness warranted so much of it, from me. From everyone. I grieved her because I loved her. I grieved her because I missed the chance to keep loving her in her final moments. I could only love her from far away. The loss I feel for my grandmother is its own, unique and personal loss. Her memory affects me, and inspires me to this day. Much of the pain, however, has passed, and for this I am thankful. That which I feel for my cat, however, has not. I caution myself from thinking that the loss of a relative, or beloved human being, ought to ever feel something more or less than the loss of any other thing. All life is so, so sacred. Sometimes the loss just feels far more severe, by proximity. I had seen Miles nearly every single day since we had left for Malaysia. We received him and his sister, Madu, very early on during our move. Their presence made what we had here, immediately, a home. Miles had a wonderful habit of letting us know wherever he was in the house. Meowing in empty rooms was his way of informing us that the party he was hoping to start was beginning without us, and we were cordially invited to join him. I wished he had done the same that fateful morning, on the balcony. I wish he had let us know, ahead of time, where he’d be. Unbeknownst to him, he went to the one place where we couldn’t join him, or protect him, and the rest, well, is the hard history we’re slowly trying to forget. I remember exactly where I was when it happened, and I’ll always remember: In the kitchen, making coffee, my morning routine. The loss is profound because, he was never, ever far away. That morning, he was simply out of reach. It was all too sudden, too soon, and too close to home. Whatever home we had, feels as though he had taken it away with him. It is losing such a love that I had grown so accustomed to – and losing it so unexpectedly – that is the real cause for the pain. It isn’t him, it is the stark reality of life without him. I had gotten so used to having him but an arm’s length away while I worked in my office, his fat, furry body sound asleep upon the red pillows. I hardly ever wondered where he was; my comfort came in knowing he was simply around, somewhere, nestled intently against whatever soft surface he could find. As if being encased in his own warm, softness weren’t enough. He needed more. Comfort was his idol if he ever had one, and I can’t blame him for that, either. 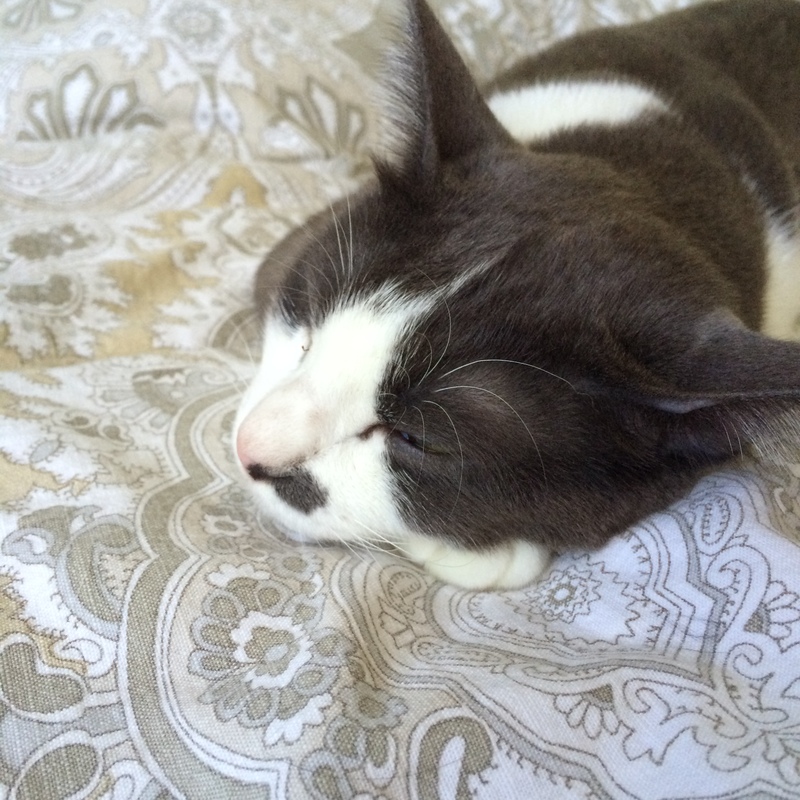 Miles, falling asleep – one of his favorite things. I don’t know when this grief will go. I pray to God that it leaves me be, hoping peace come quickly in its place. For my grandmother who had passed some months ago, and even for my other grandmother whom I had lost long before her, I had the privilege of time. In retrospect, time was the real gift, less so the grief, simply because we were all able to prepare. We knew what felt to be the inevitable. But the sting of the loss will always be. I know this because, during the memorial services for both my grandmothers, if somehow I had found the strength not to break earlier, the pressure to crumble was overpowering. The greatness of the loss, the sheer, burdensome weight of it, will win. It always wins. But they say that time heals all things. Perhaps, this is true. Time also helps brace ourselves for that which we know to be coming, if indeed, we know. There was no knowing, with Miles. And now, there is no knowing when, and how, time will work its mysterious, ancient magic. How ever reliable its powers may be, I can only pray such powers are exercised soon, and dramatically. Yes, somehow, grief is a hard, yet beautiful thing. To love something lost, so deeply, that causes memories to jolt back into being feelings I hadn’t realized were ever there, is a sacred and beautiful thing, indeed. It is, also, far too fragile. Delicate, like porcelain. And when it breaks, it shatters – the sound of which, producing a most terrifying sort of music. And yet, you have for that moment, music. These days, silence is my enemy. I’d rather hear the whimpering cries of the cat I have remaining, perhaps even the heaving, child-like sobs welling up from deep within myself, than the sound of nothing at all. I know, it won’t be, forever. I remember days when silence was precisely what I needed. When I couldn’t give anything more for that particular gift – the absence of noise to clear my mind, and mend the heart. But for today, and perhaps for many days to come, noise is what I need. The ambient sort that comes from mindless television. The whirring of multiple fans running simultaneously. The self-preserving purring from Madu. Little does she know, it preserves a little bit of me, too. Sometimes, the grieving calls forth an ugly, unintelligble sound, a garbled enunciation of what were once words, or a piercing shriek of no words at all. Sometimes, when I sense the silence encroaching, I just speak. I speak to Madu. Or to myself. Or to God, even. At the very least I know, one of the three is listening, though I’m hoping such, from all three. I do not remember the sound from Miles’ fall. I only remember the sound from my wife, thereafter. I only remember the horrid curses that came out of me that morning. The weeping uncontrollably, I remember, too. These sounds, I’m willing to part with, fast. I want new noises – joyful ones. Those that remind me that there is still much life that remains within the walls of our home. Like the skittering, scampering steps from Madu when she chases after her precious twisty-ties. Or the soulful sounds emanating from our record player, inducing us to dance the night away. Or the laughter that can’t help itself from stirring awake, the moments when we remember Miles and his endless cycle of quirky noises – when he got up from bed, when he was hungry, and even while he was sleeping. While it may feel as though he had, Miles couldn’t have possibly taken home away from us. He only meant to leave us, quietly. To walk away when his time was up, and not come back. My wife imagines him leaving through the front door, pacing around a little, and then, simply going away. Gone for good, without a sound. By then, the party would have already begun. My wife, dancing without a care in the world, Madu looking on without a clue, and me, trying to match her moves with my own deliberate awkwardness. By then, Miles would have slipped away, to a place where we couldn’t join him, having done what he came to do. He always got the party started, that silly cat. It’s now on us to end it well. Sometimes, I just need a little prompting. Do you write for yourself, or for an audience? Do you write to tell a story, or to change the hearts and minds of men? I write because I can’t, not, be honest. Writing feels like an emptying. It is like having a jar of sand that I open, and the contents of which I scatter out on a surface and sift through hollow seashells and shards of glass and jagged rocks and little stones that were once sharp rocks, smoothed over time. But mostly I’d have a lump of damp sand, once so densely packed, that it made the jar heavy. The more I pack into my little jar, the more burdensome it becomes to carry. So I spill some of it onto a page, or scatter traces of it on a public blog post. It needs some other place to contain it, outside of myself. That’s a little bit of what writing is, and what it does, for me. For me, and surely for many, writing is at first, self-serving. It is therapy. It is catharsis. It is unapologetic self-absorption. It is the hoarding of all the best recollections of things. It is the setting free of all the worst. But once the words are read by another, the writing morphs into an entirely odd and frightening beast. That which was, at first, a platform for the individual becomes a spark for conversation, a reason for dialogue, and an opportunity for community. And then, it gets scary. But if it were to remain too private — if too carefully stashed away for any wrath or embrace to welcome it — well, wouldn’t that be a shame? Maybe, of course, the only kind of honesty I know to practice is the messy, navel-gazing, endlessly questioning kind, revealing raw ideas and sleeve-worn feelings. But it’s mine, the whole lot of it, and the writing — the public writing especially — gives my brazen words their audience. My honesty wouldn’t realize its own transformative potential, were it not subjected upon the immediate whims and fancy of the public sphere. Ultimately, then, the writing becomes a remarkably humbling process — because with it comes the risk of bearing one’s soul so openly, without ever knowing for sure if it will be accepted, let alone, understood. Regardless, after such a risk I can only expect, if nothing else, a profound relief. It felt a fitting end that we spent our final evening in Vientiane, by the bank of the Mekong River. Laos is a country bordered by rivers, but there’s something about the Mekong in particular that sets apart from the rest. I still don’t quite understand it myself – perhaps I’ve simply bought into the mythic kind of quality it possesses, or that I recognize it’s significance as a “lifeline” for so many. Whatever the reason, I revere this river, it being the subject of so many books, it being the path upon which so many journeys have been taken. My path, meanwhile, was simply to walk alongside it, along with hundreds of other locals who have it as a privilege to run, jog, and stroll on the newly paved road right by this body of water. Hoards of women have even taken to performing high intensity, guided aerobic workouts at sunset, a sight that, at first, a curious thing to witness, turned quickly into the one spectacle about this incredible gathering of locals by the riverside that interrupted the tranquility of the late afternoon transitioning to dusk. The sunset was majestic. I’ve seen my share of incredible sunsets in my travels, but this one in particular will be seared into my memory for years to come. I think it’s because this one felt the least bit private. It was almost, communal, as though everyone had gathered by the river bank to witness something sacred together – the meeting of sun and river – and it implored stillness from my restless soul. After a long walk, we met up again with a friend from Malaysia, Tommy, who is on an internship in Laos for a language program. We walked back the opposite way, basking in the waning moments of sunlight, meandering slowly through crowds starting to gather at the night market. Finally, we arrived at a bustling local restaurant, which felt more like an after-work drinks destination, mostly for locals looking to end their day with Beer Lao served with ice, a platter of steamed fish and vegetables, and a view. Doing as the locals do, we opted for the same meal we saw on everyone else’s table, and sure enough, it didn’t disappoint. It was the right meal, for the right way to end the trip – simple and unceremonious, but supremely satisfying nonetheless. We had a quiet evening despite the crowds becoming increasingly raucous by the river, and our night would end earlier than most other evenings we spent throughout our travels the past two weeks. But I wouldn’t have had it any other way. I wouldn’t have done any of our trip, any other way, for that matter. Not even the unbearably long bus rides through hills, and valleys, and hardly-inhabited rural towns. Nor the uninformed adventurousness of our street food sampling that likely led to several days worth of stomach pains. And certainly not having to walk, everywhere. That is, whenever we weren’t boarding a boat or bus or train. For me, the walking might’ve very well been, everything. Surely, there are things I’d never do again. But I want to make a distinction between regretting what we had done, versus learning not to do those things again. Chances are, I’m never choosing to do an 11-hour bus ride again. Or an 8-hour one, for that matter. Or eating meat parts from a roadside stall whose origins were a little too ambiguous. Never again, for some things. Glad, nonetheless, that at least, I had. Again, a late post. Currently in Luang Prabang, heading to Vientiane tomorrow. Photos soon. I’m writing this in a hotel room in Muang Khua, a town not too far from the border of Vietnam and Laos. The Sannali hotel is the only hotel in town. Other lodging available are modest guest houses suited for backpackers. We’ve been backpacking as well, but this place, at this point of our trip felt most suitable for us. Tomorrow we venture down the Nam Ou River. The water is the color of mud, and the current flows at a pace moving as languidly as the people seem to be in this quaint town. There doesn’t appear to be a night life to speak of, and the local market when we visited it lacked the kind of frenetic energy I’ve grown accustomed to from the other markets I’ve visited in Southeast Asia. I’ve read and heard that everything in Laos moves at a much slower pace. Such was the drive to here from Dien Bien Phu. Such is the steady, quiet flow of the river. Perhaps there couldn’t have been a more appropriate easing in to Laos and the slow pace of life than arriving first at this tiny town by the river. There also couldn’t be better conditions for writing, when there isn’t much else to do but embrace the stillness. The last few days after Hanoi have been a strange combination of experiences I’ll likely never do again. Not that I’d hate to do them over, but realistically, they may very well be the sort of things I’m happy to have done, at least, once in my lifetime. Shuli and I shared an overnight sleeper train car with a French couple from Hanoi to Sapa, a mountainous region in Northern Vietnam heavily populated by the Hmong people and other ethnic groups, famous for giving guided trekking tours through the indigenous peoples’ villages, valleys, fields, and rice paddies. The trek, was at times, absolutely breathtaking. I found myself stopping, less so to catch my breath, but rather, to let it slip away, and make room for the awe to seep in more fully. I was surprised by my own feelings of envy, assuming that the families living off of their own harvest have it so much better than we do, being situated so remotely, in the midst of such lush greenery. We opted for a Homestay with a Red Dao family deep in the mountains which we couldn’t have possibly have reached without our guide, Sang, a young, Black Hmong man who works for Sapa O’Chau, the locally-run trekking company that arranged our accommodations. They also run a school, through which Sang and many other Hmong have learned English. We hiked a total of 8 hours. From Sapa, we arranged for a bus to take us to Dien Bien Phu. The bus failed to fetch us, so Sapa O’Chau had to hire two motorbikes to take us to the bus while it waited for us several kilometers ahead. When we arrived, we found that the bus was actually a mini van, filled mostly with locals, except for a bright-eyed couple from The Netherlands – Ruth and Thomas – who stood head and shoulders over everyone else and occasionally posed for pictures for curious locals. Two of the young women in the van were incredibly scantily-clad, wearing overly tight dresses and high heels – which wasn’t a good sign. Other passengers were a mother and her young son who was transporting several bags of fruits, and an old woman belonging to a tribe I couldn’t identify, who said nothing to anyone. Our motley crew of travelers experienced a flat tire not long into a trip, followed by the unfortunate episode of getting stuck in a muddy path and needing another bus to pull it forward. I volunteered my help to try and push our van, stupidly enough to get my running shoes absolutely immersed in their own puddle of mud. It was silly on my part, but we all had a good laugh about it once we got moving. After we were halted a few more times along the way due to construction work on the roads, we finally arrived in Dien Bien Phu, to a throng of aggressive men jockeying for business at the bus station. I was just relieved the ride was over, but I feared a little for the two girls that got off at the station with us. They disappeared quickly. We were on the road for a grueling, absurdly bumpy, 8 hours. It was by far the worst bus ride I’ve ever taken. Our new friends from The Netherlands were in such good spirits, however, that we figured it best to stick with them. This morning we crossed over from Vietnam to Laos, leaving at 5:30 am on a bus headed for Muang Khua. We hit the border in the middle of the morning, got our passports checked, fell in and out of sleep the rest of the way, only to wake and find ourselves deposited into the middle of town by 10:30. Another five hours on the road, finally over. I’m finding that on this particular trip, I’m doing much of the “writing work” in my mind more than anywhere else. I’m taking mental notes of vivid scenes I want to jot down to unpack in depth later, or I’m snapping a quick shot or two on my phone for the situations that feel fleeting. The actual writing I’m doing, when things have finally slowed to a deafening halt, is done primarily for the purpose of not forgetting. I’m writing for my own memory’s sake, really. Much of this trip has exhausted most of my mental capacity, if not for all the varied details I’m absorbing day to day, then surely due to all the seemingly endless hours spent on roads that are mostly, unforgiving. And then we still have the boat ride tomorrow, down Nam Ou River. Then another stop at another Lao town – Nong Khiaw – another small town which boasts a little more activity of the “eco”-variety. After which, Luang Prabang, a surefire haven for tourists visiting Laos…for better or worse. But there I also expect to sleep soundly at a quiet, comfortable abode, riverside. For that alone, and for more strong Lao coffee, I have much yet to look forward to. Due mostly to unpredictable WiFi connections, this post was actually written about a week ago, and only going up now. Also, photos to come later. I’m on an overnight train, leaving Hanoi, headed to a town further north called Sapa. I know very little about this place, other than having read it is mountainous and beautiful, and that the Hmong, and other indigenous tribes like the Dao, have made Sapa their home. Truth is, I still feel I hardly know very much about the place I’m leaving. Shuli and I have spent three days and two nights in Hanoi, sampling local dishes and sleeping in a run down “Homestay” operated by Pham and Hung, a husband and wife couple that had done their earnest in giving us a warm, comfortable welcome. Pham looked like he’d much rather be by himself, though. It seemed as if being accommodating to strangers was learned behavior – a ready smile, a firm handshake, a quick offering of food or drink, a willingness to engage in small talk. Most of it appeared exactly as such, like willingness more than genuine interest. But perhaps much of his actual feelings about us, about his work as a budget hotel operator, were really lost in translation. I didn’t leave feeling disappointed by his seeming desire to just do his own thing – I just didn’t know if it was us that left him feeling disinterested. I’m convinced that it was Hung who more than made up for Pham’s well-intended, but somewhat unnatural hospitality. Her smile was genuine and inviting. She had the sort of charm that seemed to soften her husband’s rather serious demeanor. She never undermined Pham’s rants on Vietnamese society, politics, or on the occasional bad review his Homestay might have received. She let him speak his mind, but whenever it was her turn, she always came across far more gracious, and even apologetic. I doubt that the warmth she exuded wasn’t the least bit contrived. But I could never really know. What I do know is that Hung cooked amazing meals for us time and again, shared about her life as openly as she could, went out of her way to get us whatever we had requested, let alone, merely inquired about, and still insisted on giving us a parting gift of a free bag of Vietnamese coffee, and an accompanying filter. Their home was our home for a few evenings, and they let us in on their story. From Pham and Hung we had learned how property is really expensive in Hanoi, and they are lucky to even have a home, albeit a small one, to call their own. They gave us an explanation about how land was scarce after the 80s, which had inflated the price for land for many Vietnamese. We learned that many of the women carting around vegetables in the morning are, like them, from nearby provinces, who had come to Hanoi primarily to work and make ends meet. Another visitor at their homestay had confirmed the family’s incredible, genuine warmth and hospitality, telling us that the reason Hung and Pham weren’t around to properly check us out of their homestay was probably because they had taken out this visitor’s wife and kids for a swim at a local pool. We had to make our goodbyes over the phone. Everything seemed to move at such a frenetic pace in Hanoi, ourselves included. Walking slowly was a concerted effort on my part, as I found myself having to fight off feeling like I needed to move just as quickly as the motorbikes whizzing by us. Getting around on foot felt a lot like running for cover, at times. If we weren’t trying to dodge cars or bikes, we were still having to elude people. People were everywhere. Sitting on little plastic chairs and low tables by what appeared to be these makeshift tea-drinking stations on the side of the road, sleeping on parked bikes, squatting on sidewalks, or peddling all sorts of items for sale, from tissue paper packets to cigarettes to the day’s leftover produce. Hanoi’s Old Quarter was teeming with – well, everything. Calling what was before us (and behind us and surrounding us) a frenzy of motion and activity still doesn’t quite describe what it was like navigating its tiny streets. ‘Controlled chaos’ seems more appropriate. Never had the expression “method to the madness” felt more fitting than here, as if there was an order to the disorder that made perfect sense to the locals, and left the rest of us both bewildered and amazed by everything that was happening. Like I said, the Old Quarter was teeming, with everything. I’m tempted to go lengths describing the food but I’m afraid there are many other more seasoned “foodies” who have already done the due diligence of breaking down the unique flavors found on the streets of Hanoi. Besides, I’m perfectly satisfied leaving it up to the experts to differentiate between quality broths of pho. Simply put, I enjoyed just about everything. I ate whatever was put in front of me, and more often than not, Shuli and I hardly bothered with a menu. We went to local joints that specialized in one or two dishes and gave our order as a quantity. “Two bowls”. Sometimes just holding up our fingers. We had our fair share of bowls of pho that seemed to strike a delicate balance of freshness and fatty-ness – crisp vegetables served alongside heaping bowls of noodles swimming in broth infused with the fat from the chicken or the beef. The fish sauce was abundantly available, yet subtle enough when incorporated in dishes that it never felt so overpowering. Or perhaps my palate had grown so accustomed to the taste, that it had already changed. I’m not so sure. I only know that I was surprised at my willingness to gnaw at what was clearly a pig’s hoof included in my Bun Bo Hue, or “choosing my own adventure” with spices whose power I couldn’t possibly predict until after my nose was immediately dotted with beads of sweat. If I refused to eat at a particular road side establishment, it was primarily because I didn’t really know how to make my order. Picking places that were populated with locals was a safe bet, and even better if they only served one dish. If I had it my way, (and it’s probably best that I hadn’t), if I had been traveling alone in Hanoi for a week, I’d have blown all my money just on coffee. I still don’t have an explanation for the abundance of cafes (spelled ‘ca phe’) in Hanoi. The number of options to choose from is seriously overwhelming. I’ve lived in several cities that pride themselves in their “coffee culture” but I’ve never been to a city that’s taken it to the level that Hanoi has. Between the local coffee shops offering the standard “ca phe su da” (iced coffee with milk) to higher end establishments offering ‘Americanos’ and other espresso-based drinks, Hanoi is littered with options for the casual drinker to the caffeine junkie. Me, I stuck mostly with the local Vietnamese way – incredibly strong, dark, coffee served with condensed milk and a single cube of ice. I’m not sure anything else can really compete, in my book. The list of other caffeine-based drinks that are as consistently satisfying is a short one, and this one may very well be the runaway winner. The jolt I get from the very first sip is unmatched. The subtle sweetness of the creamy condensed milk mixed in makes for a nice contrast to the robust flavor of the roast. Vietnamese coffee is, in my opinion, well worth the patience it takes to prepare it well. It is not the kind of coffee taken, on-the-go, even if everything else around seems to be flying at that pace around you, as you take it. Something about the drinking of Vietnamese coffee requires a concerted slowness in intake to appreciate all its flavor. I just can’t get myself to “down it” if I had to. It would feel disrespectful. Unfortunately, what I know is what I know. No one could explain why there was such a glaring proliferation of coffee establishments around the city. And no one could quite explain the magic behind a single cup of Vietnamese coffee, served simply, with a cube of ice. Sure, I could probably read about it somewhere, but that would just seem like I’d be doing myself a disservice to the experience. I’d rather someone walked me through it – someone wholly invested in the genuine look of pleasure on my face as I took my time with every sip. Shuli had asked me if I was ready to leave Hanoi. The pace has certainly taken its toll. I wouldn’t mind an evening that wasn’t serenaded by the incessant honking of horns. Nor would I mind regaining the experience of crossing the street without thinking each stride was a matter of life or death by motorbike. Truth is, I’ll remember how overwhelming everything appeared to be, but I’m not sure I’ll remember if I had actually felt, overwhelmed. The sense that I could’ve handled so much more of what the city offered, yet didn’t handle quite enough of it, makes me feel like, if I could, I’d at least want to give it another go. Just a little longer, for the next time – enough to actually feel ready to leave it behind. Now, it feels like I’m leaving with too many questions still unanswered. But perhaps the lingering mystery will help me remember Hanoi with a distant sort of fondness – the kind you feel after having experienced too much without having much explained to you. The details might be fuzzy, but the feelings, even the ones I don’t quite understand, remain. It may not look as if the slightly sweet, mildly bitter “milo” powder was incorporated into this delightful concoction, but inside that fluffy exterior is a surprising, subtle addition to an otherwise standard-fare snack in Malaysia. The man running this particular stall explained to me as I was preparing to leave that he had just given a training session to the boy standing there with him – whom I presume to be, his son. It appeared he had, gathering from the little that I could understand as I watched him explain the steps to the boy while whipping the roti (generally, an Indian unleavened bread) onto the table, spreading dollops of butter across the flat dough, and finally, sprinkling milo powder evenly around. “Milo”, by the way, is a chocolate and malt powder typically served mixed in with hot or cold water, and sometimes sugar, for extra sweetening. It holds a particularly special place in my own childhood as my chocolate drink of choice, growing up in the Philippines. The man laughed when the boy seemed unsure of how much milo to put in, as if he were doing so too sparingly. Even I know that you can never use enough milo. He then folded the roti to create a pocket that kept the butter and milo altogether before placing it carefully on the well-oiled, rounded skillet that looks like the kind you would use for a crepe. Each side of the square piece of roti was perfectly cooked to a flaky crisp, while maintaining a slight fluffiness to the dough inside. It was worth the wait – watching this man and this boy, carefully make this roti for me. Perhaps he was preparing the boy to the run the business for him in the future. After all, he did refer to this morning as a training. Which leads me to wonder how many of these makeshift establishments here in Penang will survive another generation growing older, and perhaps, further removed from carrying on this kind of family business. While roti would, on average, cost the customer no more than two ringgit a piece (around 60 cents), the labor cost is significant. From the preparation of the dough ahead of time, to the cooking of various sauces (in my experience, typically a curry and a tamarind “daal” for dipping), to the kneading, slapping, and frying creation of the ordered roti, all in all it is a labor-intensive process. Not to mention, the man working this particular roti stall said he’s open from 6 a.m. until 9 p.m.
After preparing mine, the boy immediately took a piece of dough and started pushing his palms into it, getting ready for the next customer’s order. As I was leaving, I told the man, the next time I come by, perhaps I’ll be buying my roti from his son, and not him. But after saying so, I realized that I wasn’t so sure. We were quickly running out of options. What appeared to be our final way home from Langkawi had quickly become just another dead-end. When we arrived at the bus station in Kuala Perlis, a gaunt, silver-haired man smoking a cigarette noticed our panicked, weary faces and decided to give us the finality we needed to hear. “You can’t buy tickets here,” he said. My wife and I and our two visiting friends, Ryan and Marian, huddled together without any other plan. Desperate for a safer alternative, we rushed the driver the moment his bus pulled in, asking if he had any room, offering him whatever cash we had. He counted the number of seats available. He only had one. We went back to the old man, our spirits deflated. He told us it would cost RM300 for the three-hour ride down to Penang. We really had no bargaining power whatsoever. “Give me a few minutes,” the man gently asked. “Why?” I said curtly, surprising even myself. My wife and I live in Penang, and it did not take long to discover Langkawi as a go-to destination for Malaysians, particularly those on the western coast of the country. It is an easily accessible getaway from cities like Penang and Kuala Lumpur, so locals and tourists alike head there for decent beaches, good, affordable food, and a respite from a faster pace of life. Ryan and Marian were long-time friends from my college days who are much acquainted with urban living in Oakland, California. It was my idea, then, that an island excursion for all of us would be most appropriate. The morning of our trip to Langkawi, however, we found ourselves already on a mad dash just to reach the jetty. My wife frantically weaved through traffic with the clock ticking, so we could pick up the tickets I chose not to print out beforehand and reach the boat departing at 8:30 a.m.
Miraculously, we made it, and after a smooth-sailing, three-hour boat ride, we booked a car to travel around the island. We proceeded to the northeast of the island, to the idyllic Tanjung Rhu beach. While the waters weren’t as green and pristine as we had hoped, we stuck around until the sun became a burnt orange to witness another shore emerge from underneath the water, making for a picturesque, sandy “walkway” dissecting the shallow sea. My wife and I took a long stroll along the new shore that surfaced, while Ryan and Marian bought some fresh coconuts. We took our time drinking up the warm juice and scraping up the coconut meat. By the time we were through, it was dusk. Suddenly I remembered we had to head to our hotel before dark. We had already missed our original check-in time so we could head to the beach instead. We drove in circles in the middle of the island, lost and panicking about how to reach our hotel until, after finding the coast, we noticed a dimly lit road with a makeshift billboard that read, in tiny letters, “Ocean Residence” the name of our hotel I couldn’t remember earlier. For some reason, I hadn’t written it down anywhere. It was too late to appreciate the actual ocean view the hotel had boasted, but at least, the four of us could enjoy a cozy, loft-style, brick-interior lodging for the remainder of the evening. The following morning promised to be a little less stressful. After checkout, we couldn’t leave our hotel right away, because I had accidentally set our car alarm off and it wouldn’t turn off. The workers at the residence started to gather around us, confused and visibly annoyed. One of the men decided to take the keys from me to look at the car himself, fiddling with the exposed wires underneath the dashboard, popping open the hood, and eventually, unscrewing the plug for the car battery altogether, just so the noise would stop. The manager made a call to the car rental office. In 15 minutes, the agent arrived, and in less than five, he managed to stop the alarm for good. Apparently, there was some broken switch in the middle of the dashboard that we needed to press if the alarm ever went off – something he didn’t bother explaining when we first took the car. Without saying much else, he encouraged us to get the car back to the ferry office well ahead of the boat departure. That much, I figured, I could handle. We had several hours still to roam the island before boarding at 5:30 p.m.
Driving along Pantai Cenang, the main drag by the coast, we found a decent Thai restaurant for lunch. Afterward, I suggested we get all get massages. But after phoning one parlor after another, we found that none of them offered a massage for under a RM100, or had enough private couples rooms to accommodate all four of us. Ryan wanted no part of the massage idea anyway. He was much more looking forward to a visit to the local aquarium. Underwater World was about as family-friendly as it would get, wasn’t too costly, and wouldn’t require us to drive much farther. From there we would head straight to the jetty. After watching penguins waddle and witnessing the aquarium staff feed the other neighboring sea creatures, we decided it was time to head for the jetty, a little after 4 p.m.
My friends and I finished a light meal at the food court at 5:15 p.m., thinking we had plenty of time to spare. But as soon as we arrived at the main departure hall, we found no line of passengers waiting. Sweat started to break on my face and armpits, immediately. All the signs said the departure time was at 5:15 p.m. I remembered watching Ryan devour a piece of chicken at 5:15. I swore to myself and to my friends, repeatedly, that I had seen the departure time listed online at 5:30 p.m. I looked at the tickets in my hand closely. 5:15. I pleaded with the staff—as if they could somehow make the boat turn back for us—to no avail. Naturally, I kicked my backpack, thinking no one was looking. Except, everyone was looking. Worse, my iPad was in there, and I regretted it immediately. My wife took over the planning for us. She had to – I was fuming mad and couldn’t think properly, let alone say much else other than swear. She quickly gathered from the staff that, if we booked another ferry to Bukit Perlis, we could catch a bus at 7:30 that would head down to Butterworth, which was on the mainland of Penang. That was our best option because it was the only one we had. I hardly said a word, nor could I look at anyone around me. I just stared blankly ahead, still perplexed by the fate that had befallen us. A familiar sort of anger, the one that overcomes me when I perceive myself making blatant, avoidable failures, consumed me. While I did my best to avoid eye contact, my wife, who is hardly ever confrontational, was determined to get my attention. My eyes were quickly filling with tears getting too heavy to hold back. I was already blowing an undesirable situation further out of proportion as if I had to make my singular planning mistake feel even worse by playing it on a loop in my head. Worse was how I couldn’t spare myself the shame of a public meltdown for something so small, and stupid. We arrived at the station 15 minutes after 7, so we blitzed over to the bus terminal, only to receive our bad news. Whatever words I had to offer to my wife and friends would have felt like another empty promise, the residue of yet another failed attempt to make things right. So I offered up none. The old man at the terminal, however, offered up his van, and his prayers. He also offered to switch cars for us. I didn’t feel I was in a position to negotiate, so, we just let him decide. The van seats offered comparable leg room to what a budget airline would afford its passengers. We all sat up straight and I couldn’t figure whether this was because we couldn’t adjust our seats, or we were still in shock that we took this man up on his offer. But the longer we drove along the coast, watching the horizon getting absorbed by a blanket of midnight blue, I noticed the tension in my body beginning to erode and I slowly started to gain that feeling I had longed for the entire trip – a quiet calm – finally setting in. After about half an hour, we reached what appeared to be his house. It looked like a flat, one-story block of concrete. A cat jumped out of the window to greet him, and then, a woman stepped out, presumably his wife. I was afraid we might sit in on an awkward exchange between her and the old man, due to what I assumed was the inconvenience we were causing. But there came no such tense conversation. The man had a Toyota Camry parked in his garage. I figured that was the car he was referring to, and it made sense that he would want to switch—he would be saving a lot of money on gas. All our stuff fit snugly in the trunk of his Camry. And while I had to sit up in front with a complete stranger for a few hours, I couldn’t help but at least feel grateful for the extra leg room. After bidding his wife a brief farewell, we hit the road again. The old man slowly reached his finger over to the car’s CD player. A few seconds passed, and then a song I’ve heard a hundred times before came on. Aloe Blacc’s voice on “Wake Me Up” would stir anyone up into a momentary frenzy. The thumping beat of the bass line when the chorus hits wouldn’t allow for any sleeping on the ride home. Soon we were then serenaded by the likes of Pitbull and Macklemore. He had this “top hits” CD on repeat. I finally asked the man for his name, feeling silly that I hadn’t bothered to do so the entire time we were with him. He explained how we were driving through the state of Kedah. He then pointed at a bright, beaming white tower standing alone on the horizon, towards Alor Setar, the capital city. He mentioned his daughter lived in Penang, and it was with her that he would spend the night. He drove like a much younger man. He tailed and bullied and whizzed past three or four cars at a time throughout the duration of the trip, even racing towards on-coming traffic on the right side of the road, just to pass slower vehicles. And since I sat up in front with him, I did a little praying of my own, closing my eyes every time I could sense him revving up to pass. It wasn’t safe. And yet, I felt absolute relief that it was Abdur Rahman, and not I, who was fully in control.